It seems that everywhere we look these days; another game from the previous generation is being remastered. 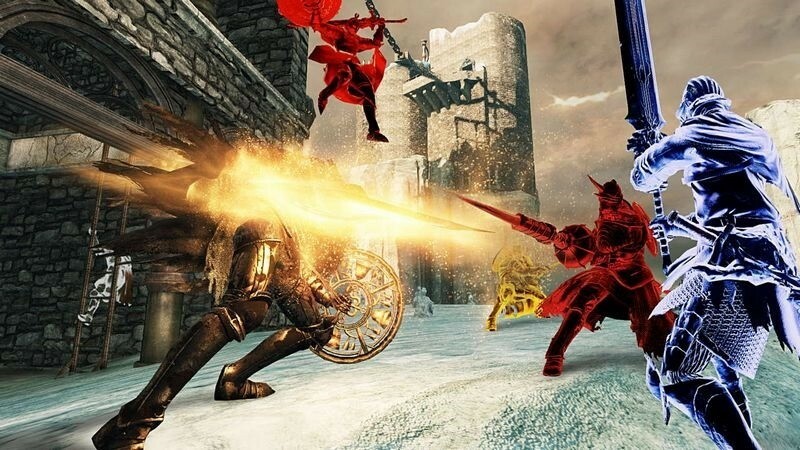 Dark Souls 2 seems to be one of them and the 3rd entry in a series of punishing games makes its way to next gen consoles bundled with all the DLC that was previously released and numerous other changes. It’s time to take another trip back to Drangleic, but only this time, we get to do it in 60 fps. Dark Souls 2’s plot is as vague as ever, and the only thing you know is that you’re Undead and the only way to rid yourself of this curse is to find a cure in the Kingdom of Drangleic. From there you set out on your quest to find a cure and uncover the truth by reading item descriptions and decoding cryptic NPC dialogue. The game also ties in heavily into the first game but to avoid spoilers I’ll not go into that any deeper. The story and its link to the first game has been a very divisive topic amongst fans, I personally feel indifferent towards it as the overall plot wasn’t that interesting in the first place. It feels too much like a rehash of the first game with less interesting characters and locations. Where Dark Souls has always shined though is with its very tight and responsive combat system, and while the combat in this game can feel a bit off at times, it still feels just as great. At first glance, the slow approach to combat might seem dull, but the strategic value in choosing your attacks wisely is what makes the system so enjoyable. It’s a thoughtful process that makes victory all the sweeter. It’s an addictive formula which is further enhanced by the deep character customization. Souls games have always allowed for some flexible character build creations and that doesn’t change here. There is a wealth of weapons and gear to choose from and half the fun is figuring out what type of character you want to create. Do you want to go for the strong, tank type character or maybe a mage or even a combination of both? It’s incredible to see just what you can come up with. Scholar of the first Sin looks and plays wonderfully, sporting a higher resolution and running at 60 fps really does make the experience more enjoyable, but the graphics are not the only thing that has been improved. Enemy and item placement has also been shifted around which not only changes things up for veterans but enemies are now placed in the world with much more thought and cohesion. Heide’s Tower of Flame actually has Heide Knights for example and the Royal Army Campsite has more soldiers while items like the Dull Ember is accessible much earlier on in the game and while it seems like small changes, it goes a long way in making the journey for immersive and sensible. There is also a new NPC that ties heavily into the story as well as more comprehensive item descriptions. This new iteration doesn’t do too much new, but what it does, changes the overall experience for the better, but while I do appreciate and welcome them, I still have some major issues with the base game. 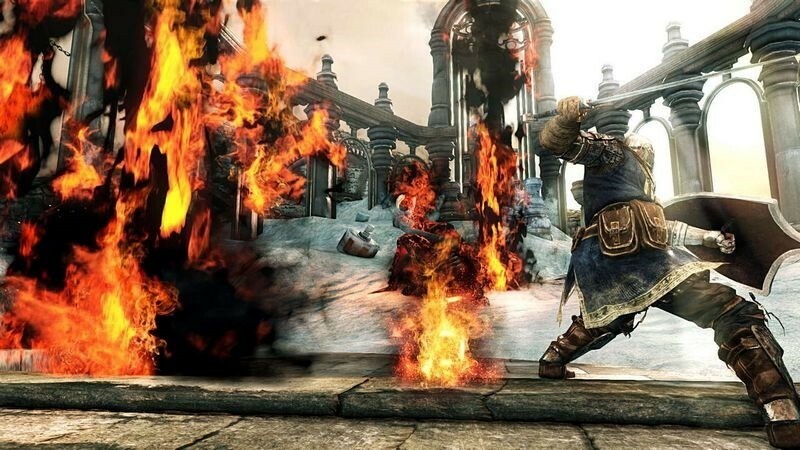 Dark Souls 2 is a game obsessed with its legacy and it has a strange infatuation with being a difficult game. 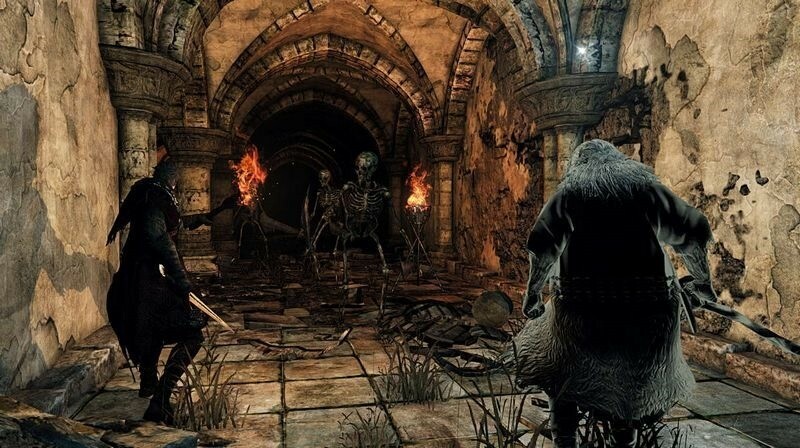 Make no mistake, the Souls series has always been difficult but it was never the focal point of their design and this is easily seen in the way their worlds were constructed and how the gameplay flowed throughout, which created a certain kind of natural, harmonic synergy between the player and the game. Dark Souls 2 seems to have forgone that approach in favour of a more direct and honestly, artificial experience. See, Dark Souls 2 seems to revel in the plight of its players, taunting them endlessly with the idea that this is a difficult game and that they will die, over, and over again. This point is driven home by the inclusion of a monument which serves as a counter, tallying up the amount of deaths players from around the world have experienced. It always struck me as an odd thing to have in the game, but I realized that Dark Souls 2 wants you to die, it wants you to have a hard time, but it also wants to be your friend at the same time. In the opening hours of the game, once you reach Majula, you’ll come across a covenant that you can join which actually increases the damage output of enemies, making them harder to deal with should you join unbeknownst of it’s true purpose. Enemies no longer respawn infinitely and after you kill them a few times they’ll be completely gone from that area which should make traversal easier but makes farming harder. This can be reversed however, by either joining the previously mentioned covenant or by using a Bonfire Ascetic which respawns all enemies in an area but substantially increases the difficulty. You start off with one Estus Flask (a recovery item that replenishes when you rest at a Bonfire) this time around which also seems like it would make the journey a bit harder, but it is immediately alleviated by an overabundant supply of other consumable recovery items. It all comes across as bi-polar behaviour and feels like it lacks proper focus. The biggest offender however is that Dark Souls 2 reuses too many concepts from the previous game. Some areas, bosses and NPCs felt like it was ripped straight from Dark Souls 1 and some of them, actually were. 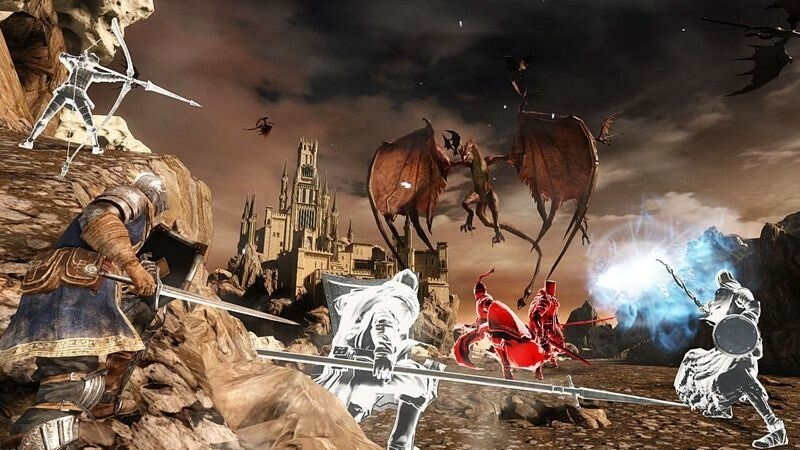 We get bosses such as the Belfry gargoyles which are just copy and pasted versions of the Bell gargoyles in Dark Souls 1, the Royal Rat Authority which equates to an emotionless spin-off of The Great Grey Wolf Sif and the Scorpioness Najka, the woman with the body of a giant scorpion that feels like a less awe inspiring copy of Quelaag. Most of the remaining bosses are even less memorable with a large number of them being unnecessary mob battles. They’re not all bad though as some of them were extremely interesting and fun like the Lost Sinner and Demon of Song, but majority of the boss battles are easily forgettable. The copy-paste mentality extends even further into the game’s world. Areas such as the Black Gulch are reminiscent of Blight Town, there are NPCs that you can only speak to if you’re wearing a certain item just like Quelaag’s sister and there is even a talking cat. I get that it’s a direct sequel, but it comes across as lazy and uninspiring and feels like needless fanservice. Again, it’s not all bad as some NPCs are really intriguing and hard to figure out and some locations will you leave you with your jaw hanging on the floor, but there’re so few of these moments that I ended up wishing there was more of that and I hardly took note of the majority of the locales. I had more issues on a technical level with the game as well such as inconsistent framerates, the ridiculous way enemies track you while you move around them and the infuriatingly broken hit detection areas wherein an attack that seems like it should miss ends up connecting. 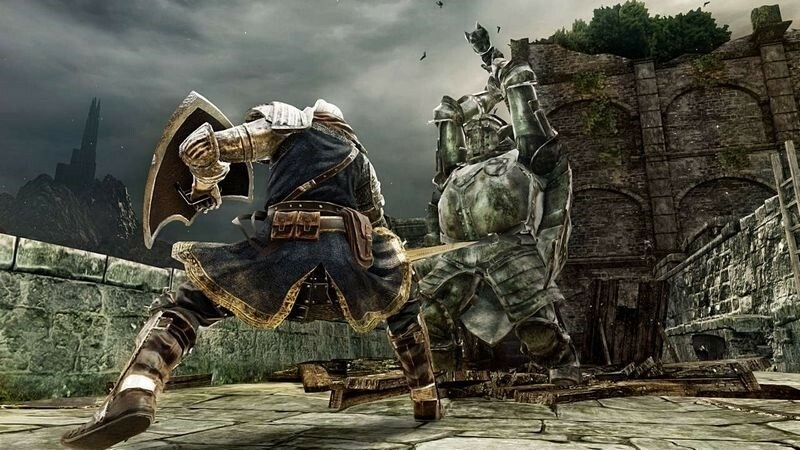 After all is said and done, Dark Souls 2 is still a pretty good game, and while it may be the weakest entry in the series, it’s an enjoyable experience in its own right. It still provides a solid experience with tweaked multiplayer functionality and the included DLC does a lot to inject some much needed unique flavour into the game. While it’s a hard sale for those that have already played the game to death, even with all the changes, but if you’ve never played it before, it’s an easy recommendation. Pick this game up as it’s chocked full of content that is still well worth your money. It’s no Bloodborne though.